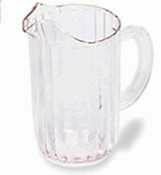 Rubbermaid Commercial FG333600CLR Bouncer Pitcher, 32-Ounce. 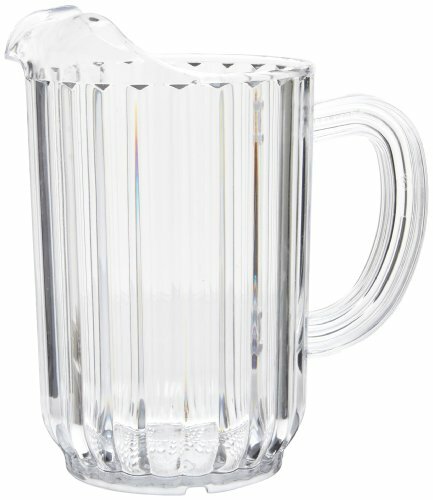 Durable polycarbonate pitcher, with drip-proof spout, resists chipping and breaking. Lighter weight and is less costly than glass. Commercial dishwasher safe. Certified to NSF Std. #2. 6.125 inches long by 4.125 inches wide by 6.75 inches high. 0.533 pounds. Made in the USA. Designed for safety and lower replacement costs. Handle designed for comfort and control. The Rubbermaid Commercial Products FG333600CLR 32-Ounce. 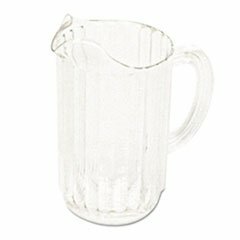 Clear Bouncer Pitcher is made of Durable polycarbonate that resists chipping and breaking. The pitcher will not shatter when dropped and will maintain integrity. 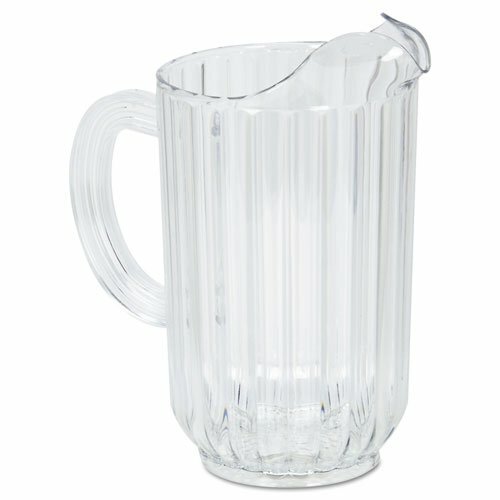 The pitcher is designed to safely serve cold beverages without the threat of shattering like glass pitchers. They are also lighter weight and less costly than glass which provides less wait staff fatigue and concerns over refreshing stock. The pitcher has a Drip-proof spouts so the liquid will not drip from sides. 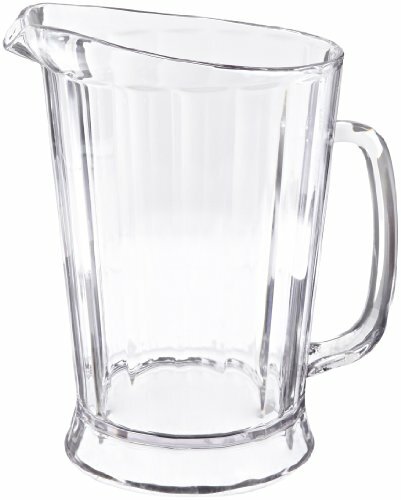 Rubbermaid® Commercial - Bouncer Plastic Pitcher, 60-oz., Clear - Sold As 1 Each - Designed for safety and lower replacement costs. Designed for safety and lower replacement costs. Polycarbonate plastic resists chipping and breaking. Drip-proof spout, self-draining bottom. Dishwasher-safe. Designed for safety and lower replacement costs. Polycarbonate plastic resists chipping and breaking. Drip-proof spout, self-draining bottom. Dishwasher-safe. 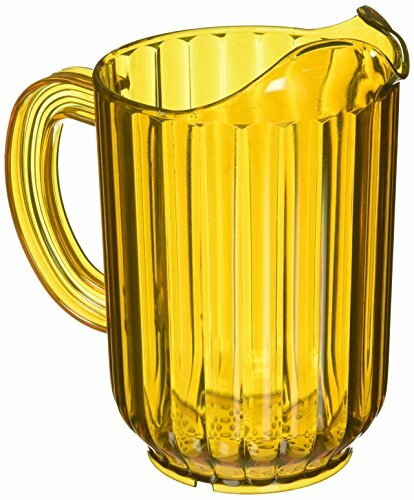 Capacity (Volume): 48 oz; Number of Cups: 6; Color(s): Clear; Material(s): Polycarbonate. 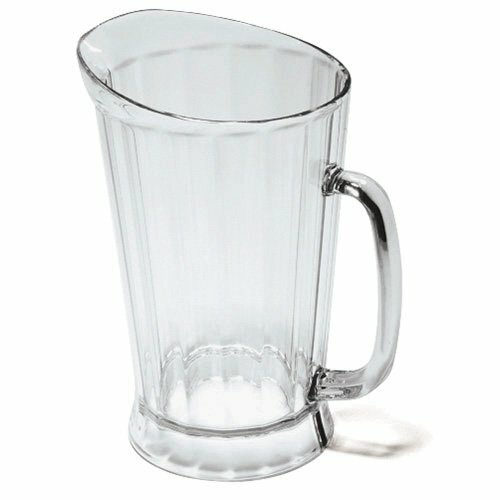 Rubbermaid Commercial FG333400CLR Bouncer II Pitcher, 60-Ounce. 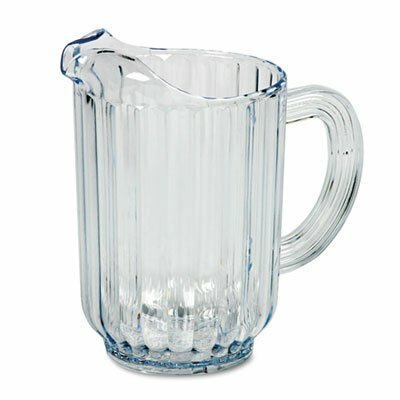 Durable polycarbonate pitcher, with drip-proof spout, resists chipping and breaking. Lighter weight and is less costly than glass. Commercial dishwasher safe. Certified to NSF Std. #2. 7.5 inches long by 5.5 inches wide by 9 inches high. 1.002 pounds. Made in the USA. Designed for safety and lower replacement costs. Polycarbonate plastic resists chipping and breaking. Drip-proof spout, self-draining bottom. Dishwasher-safe. 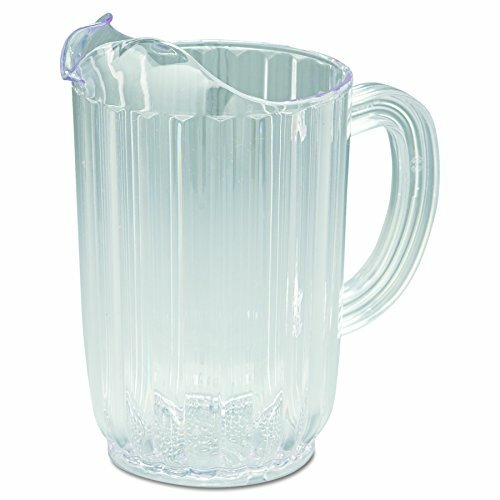 Capacity (Volume): 54 oz; Number of Cups: 6 3/4; Color(s): Clear; Material(s): Polycarbonate.